It was the cacophony of literally hundreds of scooters honking their hooters that welcomed me to Vietnam as we attempted to cross a busy road. Half way through the holiday a Danish woman asked if, because of me using a wheelchair, we had been shown greater consideration when trying to navigate our way across the Vietnamese roads. Absolutely not was my reply. This was no criticism of Vietnam, or their citizens, but just fact – and a demonstration of their very pragmatic way of addressing disability. This month Purple is shining a light on disability and travel. As part of our activity I am writing three blogs about my recent family holiday to Vietnam. 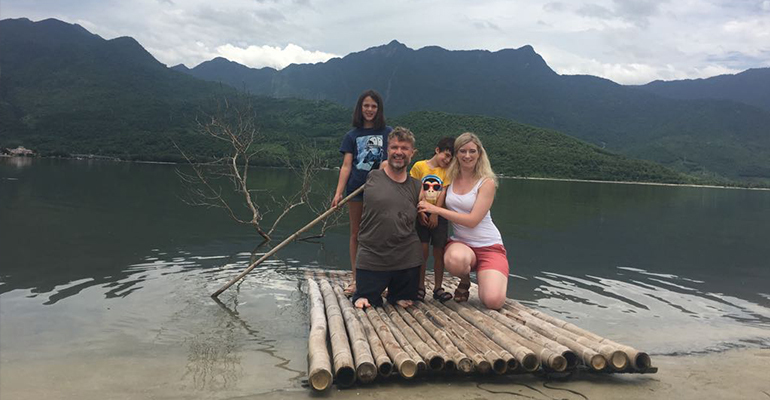 I have never written a travel blog per se and have no intention of starting – this is more my reflections as a disabled traveller (with my partner and two young children, of 10 and 5). So back to my summer holiday. The Vietnamese definitely do not do accessible pavements. In all cities pavements are where scooters are parked! And where there is a space, the pavements are often in need of repair, and so access is very much via walking on the road. On the first day in Hanoi we were given the ultimate lesson – how to cross a road. And fundamental to this process was to move as slowly as possible. The theory is the slower you go the easier it is for scooters (and the odd car) to stop and let you pass or to swerve around you. If you start to run the chances of a collision multiply. Imagine crossing an 8-lane carriageway in slow motion as about 500 scooters descend on you (tooting their horns to tell you they are coming) and that was our experience. Ruby bought a Vietnam ‘traffic light’ t-shirt that summed it up nicely. It said: Green – I can go; amber – I can go; red – I can still go! But that is just how it is and, once we had that cultural expectation explained to us, we got on with it and never felt unsafe. When travelling by minibus from Hanoi to Halong Bay (passing by people working in the paddy fields at the base of mountains) we stopped at what I can only describe as a service station. Here we stumbled upon a supported workplace for disabled people. My antennae told me I was in for a highly uncomfortable experience – but it was not. And part of the reason was due to the quality of the products being made. We bought a hand-made silk thread picture of a sunset at Halong Bay, which was wonderful, and already has pride of place on our kitchen wall. The disabled people were clearly highly trained and skilled craftsman, either in art or woven pictures, or ceramics and pottery. Kids also have a wonderful way of keeping you grounded with my five-year-old, Daniel, asking me if I wanted to stay and do a few hours work! In Vietnam, the overall the approach taken to me could be best expressed as watchful pragmatism. In each city we visited we had a driver and minibus. The step into the minibus was far too high for me and so my partner, Kristine, would lift me up the first time under the watchful gaze (and astonishment at the weight she was lifting!) of our driver, and subsequent times she would be gently pushed to one side as the driver then lifted me in and out. The same approach was taken to boats, rowing boats and motorcycle’s – the latter being the most hair raising experience of the trip as we zoomed down jungle tracks on a DIY buggy attached to a motorbike, with the driver seemingly oblivious to four western tourists hanging on for dear life (with a wheelchair also on board! ), and narrow bends in the jungle track for which the brake was clearly not in use. In many ways it was lovely that health and safety rules were non-existent, and I got to do everything without questions – I was able to make decisions myself about my own safety, rather than a risk assessment form dictating what I could and couldn’t do. Disability is quite prominent in Vietnam culture and certainly not hidden away. From the supported workplace in the service station, to residential centres and the general visibility of all impairments on the street – I did not feel out of place, or unique. In fact, everywhere we went I was recognised, from street market traders, to the beaches and in the jungle. They had seen me on YouTube, which I thought was amazing. Good for the ego, and a massive tick in the box for how well Purple had gained an international profile. However, it soon turned out to be a case of mistaken identity – they thought I was Nick Vujicic an Australian evangelist and motivational speaker, who has undertaken presentations across Vietnam on “life without limbs” – and to his absolute credit had gone down extremely well. With kids (like me), a tall partner (like me), and living without limbs (like me), you can understand the confusion! If Purple can be half as successful as Nick in building a profile in developing countries like Vietnam, we will have a blueprint for success. No trip to Vietnam, and Ho Chi Minh City (formerly Saigon) would be complete without visiting the War Remnants Museum. The modern disability movement, and creation of user-led organisations (for which Purple’s foundations are rooted), emerged from the Vietnam war when veterans returned disabled to America and fought for the right to work and other day to day activities, hitherto taken for granted. Berkeley in California is where the first disability user-led organisation was created. It is probably fair to say I would not be doing what I do today without the Vietnam war, and I do not believe disabled people across the world today, and certainly in developed countries, would have had the freedoms and opportunities we see (it needs to get much better). As we walked around the museum and saw in graphic detail the raw carnage and destruction caused, there was a crumb of comfort that the suffering had been the catalyst for a positive legacy for so many. In terms of being a disabled traveller, I would like to say a huge thanks to Travel Counsellors, who thought about all aspects of access in putting the trip together, and in particular Liz Standley, our personal Travel Counsellor. Being a disabled person should not mean you are unable to travel, and disabled people want to travel. It just means that you sometimes need a few additional checks or requests to be explored before you feel safe to hit the ‘book now’ button and having a travel company who understand that is essential to the process. I very much hope they will become a Purple member and work with us to further extend and develop their disability expertise. Easia, who organised all our excursions and provided our wonderful drivers and guide – they also had access in the forefront of their mind and in a very pragmatic way. Our holiday was more than a holiday. It was an immersion into a different culture, with the right blend of tours, relaxation and activities – from learning to make traditional kites in Hue to the local markets of Halong City – and we couldn’t have done it alone. Thai Airlines and Vietnam Airlines also deserve a mention for the way they both made my travel so uncomplicated and smooth. If you are looking for inspiration for your next trip, I would highly recommend Vietnam. A country of outstanding natural beauty – from mountains, to beaches, and the rural countryside – with friendly people, wonderful food and lots of options for experiences and activities. And finally, a big thank you to Nick Vujicic who unwittingly made me feel a superstar for a number of days…and then gave the kids plenty to laugh about when the truth was uncovered!